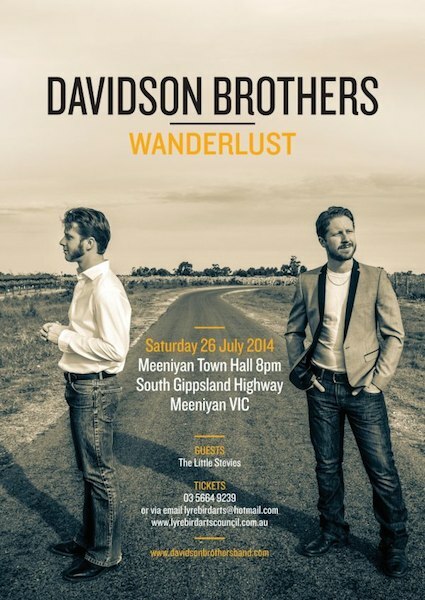 Davidson Brothers to Play Meeniyan Hall. This Saturday 26ht July, the Davidson Brothers will play Meeniyan Town Hall for the first time, with special guests The Little Stevies. Tickets are selling quickly but there’s still some available. Hamish and Lachlan Davidson grew up just down the road from Meeniyan in the town of Yinnar. Raised in a musical family, the brothers began playing music and performing from a young age. With seven albums under their belt, they have built the reputation of being one of Australia’s hottest bluegrass acts . Australian Country Music Award winners in 2009, 2010 and 2012, Hamish and Lachlan Davidson are “the best young bluegrass pickers we have seen for a long while in Australia and a very exciting live act. They appeared on the Ryman in Nashville at the 2010 International Bluegrass Music Awards as presenters and showcased at IBMA’s World of Bluegrass in 2004 and 2009 and the 2011 European World of Bluegrass in the Netherlands. Winner of multiple Australian National Bluegrass Championship titles on fiddle, banjo and mandolin, After recording four albums in the US, Hamish & Lachlan knew it was time to record in their native country with their live band. 2014 will see the release of their brand new album ‘Wanderlust’ featuring ten original tracks recorded in Melbourne, Australia featuring Jacob McGuffie on acoustic guitar and Louis Gill on upright bass.